Does Antarctica Have A Hidden Layer Of Meteorites Below Its Surface? In the category of why-didn’t-I think-of-that ideas, Dr. Geoffrey Evatt and colleagues from the University of Manchester struck upon a brilliant hypothesis: that a layer of iron meteories might lurk just below the surface of the Antarctic ice. He’s the lead author of a recent paper on the topic published in the open-access journal, Nature Communications. Remote Antarctica makes one of the best meteorite collecting regions on the planet. Space rocks have been accumulating there for millennia preserved in the continent’s cold, desert-like climate. While you might think it’s a long and expensive way to go to hunt for meteorites, it’s still a lot cheaper than a sample return mission to the asteroid belt. Meteorites fall and become embedded in ice sheets within the continent’s interior. As that ice flows outward toward the Antarctic coastlines, it pushes up against the Transantarctic Mountains, where powerful, dry winds ablate away the ice and expose their otherworldly cargo. Layer after layer, century after century, the ice gets stripped away, leaving rich “meteorite stranding zones” where hundreds of space rocks can be found within an area the size of a soccer field. Since most meteorites arrive on Earth coated in a black or brown fusion crust from their searing fall through the atmosphere, they contrast well against the white glare of snow and ice. Scientists liken it to a conveyor belt that’s been operating for the past couple million years. Scientists form snowmobile posses and buzz around the ice fields picking them up like candy eggs on Easter morning. OK, it’s not that easy. There’s much planning and prep followed by days and nights of camping in bitter cold with high winds tearing at your tent. Expeditions take place from October through early January when the Sun never sets. The U.S. under ANSMET (Antarctic Search for Meteorites, a Case Western Reserve University project funded by NASA), China, Japan and other nations run programs to hunt and collect the precious from the earliest days of the Solar System before they find their way to the ocean or are turned to dust by the very winds that revealed them in the first place. Since systematic collecting began in 1976, some 34,927 meteorites have been recovered from Antarctica as of December 2015. Meteorites come in three basic types: those made primarily of rock; stony-irons comprised of a mixture of iron and rock; and iron-rich. Since collection programs have been underway, Antarctic researchers have uncovered lots of stony meteorites, but meteorites either partly or wholly made of metal are scarce compared to what’s found in other collecting sites around the world, notably the deserts of Africa and Oman. What gives? Dr. Evatt and colleagues had a hunch and performed a simple experiment to arrive at their hypothesis. They froze two meteorites of similar size and shape — a specimen of the Russian Sikhote-Alin iron and NWA 869, an ordinary (stony) chondrite — inside blocks of ice and heated them using a solar-simulator lamp. As expected, both meteorites melted their way down through the ice in time, but the iron meteorite sank further and faster. I bet you can guess why. Iron or metal conducts heat more efficiently than rock. Grab a metal camera tripod leg or telescope tube on a bitter cold night and you’ll know exactly what I mean. Metal conducts the heat away from your hand far better and faster than say, a piece of wood or plastic. The researchers performed many trials with the same results and created a mathematical model showing that Sun-driven burrowing during the six months of Antarctic summer accounted nicely for the lack of iron meteorites seen in the stranding zones. 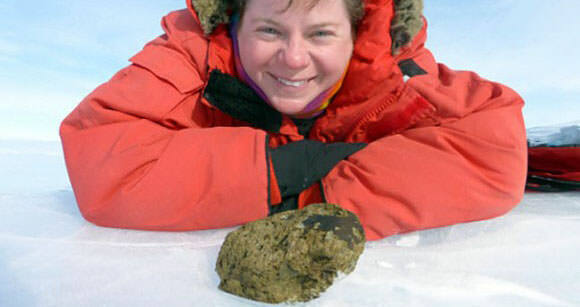 Co-author Dr. Katherine Joy estimates that the fugitive meteorites are trapped between about 20-40 inches (50-100 cm) beneath the ice. You can imagine how hard it would be to dig meteorites out of Antarctic ice. It’s work enough to mount an expedition to pick up just what’s on the surface. With the gauntlet now thrown down, who will take up the challenge? The researchers suggests metal detectors and radar to help locate the hidden irons. Every rock delivered to Earth from outer space represents a tiny piece of a great puzzle astronomers, chemists and geologist have been assembling since 1794 when German physicist Ernst Chladni published a small book asserting that rocks from space really do fall from the sky. Like the puzzle we leave unfinished on the tabletop, we have a picture, still incomplete, of a Solar System fashioned from the tiniest of dust motes in the crucible of gravity and time. Articles like this make me that much uneasier that, prior to the Apollo moon landings, heads of NASA- including Dr. Wernher von Braun- made an expedition to Antarctica. Pretty cool! I love reading the ANSMET season blogs, maybe next year they’ll bring metal detectors along! I sure hope they’ve been using metal detectors all along! Otherwise, duh? Nice work! That’s slap my forehead and say “why didn’t I think of that?” clever.